We develop machine learning techniques to better understand chromatin biology. These models and algorithms transform high-dimensional functional genomics data into interpretable patterns and lead to new biological insight. 2019-02-13: Mehran finishes a revision of "Virtual ChIP-seq: Predicting transcription factor binding by learning from the transcriptome", a preprint on bioRxiv Bioinformatics. 2019-01-23: Michael (principal applicant) and Samantha (co-applicant) receive a grant from Canadian Institutes of Health Research (CIHR) for their project on "DNA methylation profiling in cell-free DNA: a non-invasive method to screen for pre-term birth". 2019-01-15: Davide, Sarah, and Michael are co-authors on "BEHST: Genomic set enrichment analysis enhanced through integration of chromatin long-range interactions", a preprint on bioRxiv Bioinformatics. 2019-01-03: Michael is an invited speaker at Pacific Symposium on Biocomputing (PSB) 2019 in Kohala Coast, Hawaii, USA. His talk covers: "Modeling methyl-sensitive transcription factor motifs with an expanded epigenetic alphabet". 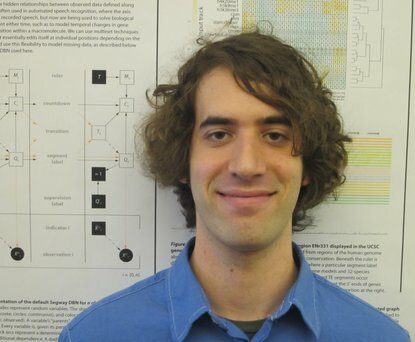 2018-12-08: Coby was awarded the Alfred B. Lehman Graduate Scholarship from the Department of Computer Science. 2018-11-26: Michael is an invited speaker at a special seminar jointly hosted by the School of Computing and the Department of Biomedical and Molecular Sciences at Queen's University, Kingston, Ontario. His talk covers: "Identifying transcription factor binding using open chromatin, transcriptome, and methylation data".